“More vicious rifts than a pack of starving polecats.Their Ramones back to back style delivery is giving us speedy three minute slices of rock gold.BO-PEEP won over the audience easily,…they were the stars of the evening.” -David Harrison, Music Towers, U.K. “BO-PEEP,won a flock of new fans with their brutal live show and grunges-up guitar workouts, and even found acclaim in The Guardian and The Sun, despite previously having no profile whatsoever. Lawks.” -www.PlayLouder.com *BO-PEEP’s fourth album “SICK ORANGE TELEVISION” is out now! If you are in Japan, you can buy our CD at Tower Records or HMV in some cities. Or, you can buy it from the 3rd Stone Store. If you are outside Japan, check your iTunes Music Store. BO-PEEP’s music is available at the iTunes Music Store in many countries around the world. If it’s not available in your country, please let us know. Thanks! 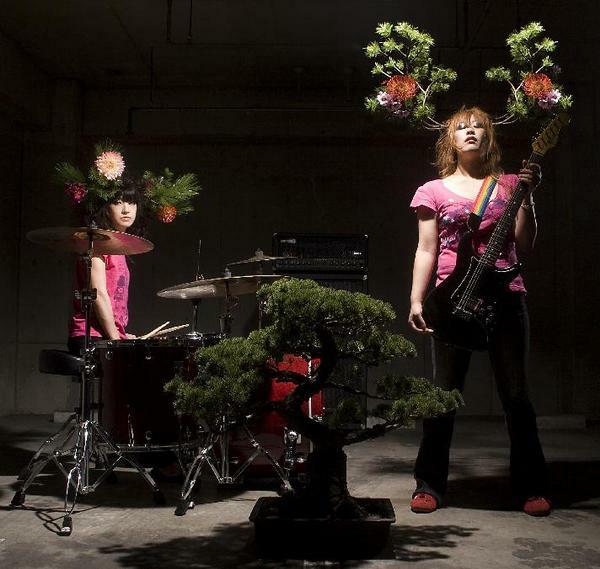 PROFILE: The origins of BO-PEEP go back to school days in Fukuoka, Japan where Mika Yoshimura (guitar, vocals) and Ryoko Nakano (drums, chorus) met and decided to form a band. By Junior College days, the band was reformed, and with Junko Himei (bass, chorus) all the elements were in place. After playing out extensively in Fukuoka, and recording independently, BO-PEEP moved it’s base to Tokyo, capital of Japan, where they joined Mother Records and continued to tour not only Tokyo, but other parts of the country as well. BO-PEEP achieves the utmost simple chaos from their instruments, solid brittle lyrics and cage-rattling vocals. At the core of that chaos is pure harmony surrounding solid, catchy melodies and in that blend comes their originality. With MO’SOME TONEBENDER’s Isamu Fujita as engineer on their latest album, BO-PEEP’s studio recordings have the aura and power of live performances. Tower Record’s BOUNCE magazine in Japan says: “It’s hard to imagine the extent of this 3-piece girl band’s dense, intense sound piercing the world as it does”. The first album, “0X3? was recorded in 2003, and the second, “Time of Rock” was recorded in 2005. You can hear some of the songs on the player at the top. Our CDs are available at Tower Records and HMV in Japan, as well as the 3rd Stone From the Sun website, and on iTunes Japan.